Geetha Baskaran completed her Diploma in Computer Science (Software Engineering) and BSc (Hons) in Computer Science majoring in Software Engineering at the University Putra Malaysia (UPM). She worked in industrial and completed Master in Software Engineering part time at University Malaya. She was awarded Silver Medal for her master’s project. She started her career as a software engineer and progressed to Project Manager. During these years, she led numerous successful projects with highly motivated team of programmers. She received the Outstanding Service Award from Worldwide Info-systems. She then continued her journey to education sector as an IT Lecturer at Prime College. Here, she managed many corporate trainings and has been the chief examiner and chief supervisor beside the lecturing roles. In addition, she was involved in the redesigning of the Diploma courses which led to MOE and LAN preparation. 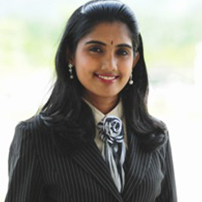 Geetha was appointed as an Assistant Professor and moved to the University of Nottingham Malaysia Campus (UNMC) in 2006. She completed her PGCHE in 2009 and was awarded Fellow of the Higher Education Academic in 2010. She completed her PhD in Domain Transformation Staff Scheduling. She won Excellent Presentation Award in Tokyo for her first PhD research scientific paper. In 2010, she received the prestigious Lord Dearing Award for her teaching. She also received the Best Paper Award in an international conference held in Jakarta 2014 and Prague 2016. Her interest in innovative technologies has directed her to multi-disciplinary research which involves a diverse range of areas. She received Gold Medal (2015), Silver and Bronze (2016)and Gold and Bronze (2017) in National Innovation competition. In accordance to her PhD work, Geetha was invited as a Keynote speaker in an International Conference in Dubai 2015. There are many administrative roles that she has undertaken during her service here. The roles as Vice Chair , Athena SWAN Champion and Program Champion of Gender Equality in Nottingham (GEN) UNMC since 2013, has given her so much of courage to contribute gender equality and work life balance. Geetha as the Athena Champion for her school took the lead to collect data for the successfully awarded Athena Bronze SWAN status for Faculty of Science (FOS) 2014 and in October 2016 she was appointed as Chair of FOS Equality & Diversity. She is also the Chair to lead in the Athena SAT team to submit our next award renewal in April 2017. Recently in 2018, she became the pioneer in her university to receive the Senior Fellow of Higher Education Academy (UK). She has been blessed with two lovely children; a eleven year old daughter and a seven year old son. She has been elected as the first women president of parents-teachers association at SK (2) Jln Bkt, 2014 to 2018. Besides, she also conducts charity shows via her interest in dance for the charity homes for the past 12 years. Geetha’s current research interests are domain transformation on staff scheduling problems using constructive and deterministic technique; information granulation; comparisons among different algorithms and search space analysis, complexity issues in scheduling, and case studies including other scheduling problem. She is also interested in developing multi-disciplinary research which involves a diverse range of areas such as research on innovative technologies used in education, games, human computer interaction and project management, research on students learning style, and mathematical modelling.